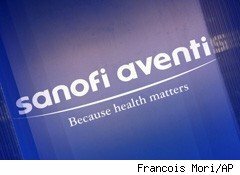 French drug company Sanofi-Aventis (SNY) has finally made a deal to buy biotech company Genzyme (GENZ) for $20.1 billion, about $74 a share. Genzyme shareholders will get a contingent value right that represents potential future payments if Lemtrada, the company's multiple sclerosis drug, is a success. Sanofi has tried to close a deal for about nine months as the Genzyme board lobbied for a higher price. The reasons for the buyout are similar to those of all purchases of biotech firms by big pharma. Patents on blockbuster drugs, which provide much of their earnings, are expiring or have already done so. Genzyme's shares traded just above $47 last June. Sanofi must assume that the smaller company is undervalued by nearly 60%. Its shares rose above the offer price for two brief periods in 2008, but Wall Street clearly thought that valuation was too high as traders pushed the price lower in late 2008. Genzyme's sales prospects have also been spotty as revenue dropped from quarter to quarter for most of the last year. Sanofi may realize the value that it will pay as part of the premium price for Genzyme, but if the biotech is not a blockbuster machine, the French firm will have overpaid.